This week’s book is Déjà Dead by Kathy Reichs, one of my TBRs. I wasn’t thinking about the man who’d blown himself up. Earlier I had. Now I was putting him together. ‘These murders have me pretty much uptight.’ I regretted saying it immediately. ‘What murders?’ Her voice was becoming thick, the words rounded and soft on the edges. ‘A pretty nasty one came in last Thursday.’ I didn’t go on, Gabby has never wanted to hear about my work. The meticulously dismembered body of a woman is discovered in the grounds of an abandoned monastery. Enter Dr Temperance Brennan, Director of Forensic Anthropology for the province of Quebec, who has been researching recent disappearances in the city. Tempe takes matters into her own hands, but her determined probing places those closest to her in mortal danger. Can Tempe make her crucial breakthrough before the killer strikes again? Kathy Reichs is one of those authors that I keep seeing around, but I’ve never read any of her books. I wondered if I’d like them, so when I saw this book in Barter Books a few years ago I brought it home with me – it’s been sitting on my shelves ever since. It’s the first in her Temperance Brennan series – and her debut novel. 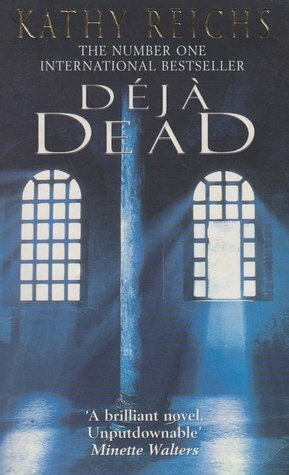 Déjà Dead is terrific and terrifying in its own right, easily rising above Cornewellian similarities … Excellent plotting, appealingly headstrong heroine and superb mastery of tension. Will it live up to such high praise, I wonder? If you’ve read it what did you think? I’ll be interested in what you think of this one, Margaret. I think Temperance Brennan is an interesting character. myself. In fact, I’m glad you reminded me of this series, because I’ve yet to do a spotlight on any of those novels, and I should. I’ve read a couple of books in this series, but am pretty sure this wasn’t one of them. They were back in the days where I read what I found on the library shelf, not necessarily in order. I liked them well enough, but somehow I never really bonded with the characters. Now the TV show – I liked that a lot. And it is different than the books. Hope you enjoy it! I have been seeing this author’s books around, too, and I’m definitely curious! Thanks for sharing…and for visiting my blog. Enjoy your weekend! I have read quite a few books in this series but in sort of random order. I should try to catch up as I have enjoyed all the ones I’ve read. This week I am featuring A Death of No Importance by Mariah Fredericks. Happy reading! Here’s mine! http://bit.ly/F56NelsonKing HAPPY EASTER! Sounds very good!! Happy Easter weekend! Kathy Reichs is on my list of must-try authors. I’ll be interested in hearing your thoughts about this book. I’ve read this one and enjoyed it and book 2 even more. That’s as far as I got though and I’m not sure why. I’ve also seen about seven seasons of the TV series which is different to the books but not bad at all. The show is fun but the books are way better and so different.